Dr. Orr is an evolutionary geneticist with several broad interests. Most of his research focuses on the genetics of speciation and the genetics of adaptation. In particular, he is interested in the genetic basis of hybrid sterility and inviability, e.g., how many genes cause reproductive isolation between species? What are the normal functions of these genes and what evolutionary forces drove their divergence? He studies these problems through genetic analysis of reproductive isolation between species of Drosophila. In his adaptation work, Dr. Orr is interested in theoretical rules or patterns that might characterize the population genetics of adaptation. He studies these patterns using both population genetic theory and experiment. Genetic basis of male sterility in hybrids of Drosophila pseudoobscura and D. persimilis. 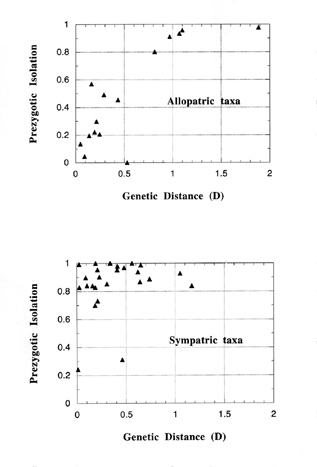 The strength of prezygotic (sexual) isolation plotted against genetic distance (D) among allopatric vs. sympatric species of Drosophila. Masly, J.P., C.D. Jones, M.A.F. Noor, J. Locke and H.A. Orr.2006. Gene transposition as a cause of hybrid sterility.Science313:1448-1450. Orr, H.A. and S. Irving.2005. Segregation distortion in hybrids between the Bogota and USA subspecies of Drosophila pseudoobscura.Genetics169:671-682. Orr, H.A.2005. The genetic theory of adaptation: a brief history.Nature Reviews Genetics6:119-127. 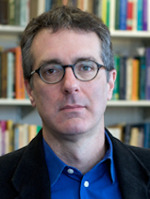 Coyne, J.A. and H.A. Orr.2004. Speciation. Sinauer Associates, Sunderland, MA. Presgraves, D.C., L. Balagopalan, S.M. Abmayr and H.A. Orr.2003. Adaptive evolution drives divergence of a hybrid inviability gene of Drosophila.Nature423:715-719. Orr, H.A.2002. The population genetics of adaptation: the adaptation of DNA sequences.Evolution56:1317-1330. Orr, H.A. and M. Turelli.2001. The evolution of postzygotic isolation: accumulating Dobzhansky-Muller incompatibilities.Evolution55:1085-1094. Orr, H.A. and S. Irving.2001. Complex epistasis and the genetic basis of hybrid sterility in the Drosophila pseudoobscura Bogota-USA hybridization.Genetics158:1089-1100. Orr, H.A.1998. The population genetics of adaptation: the distribution of factors fixed during adaptive evolution.Evolution52:935-949. Orr, H.A.1995. The population genetics of speciation: the evolution of hybrid incompatibilities.Genetics139:1805-1813. Coyne, J.A. and H.A. Orr.1989. 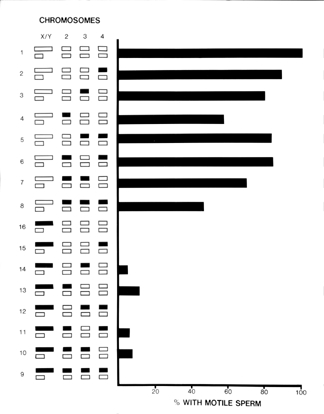 Patterns of speciation in Drosophila.Evolution43:362-381.